I get bored really easily. If a book isn’t grabbing me by my shirt and pulling me through…I’ll put it down and possibly never come back. It’s sad, but true. My favorite author was always Dean Koontz, but then his books changed and I’ve lost interest. I’d still recommend Door To December and Fear Nothing. Those were amazing! I don’t have an ereader. I prefer the tangibility of books. The smell of books. I just can’t convert. I prefer paperback. I think paperback books should be released the same time as hardback. Hardback’s don’t fit into my purse! My goal is to find a book that reminds me of Final Fantasy storylines. They are epic and touch my heart. I wanna get lost in a world like Ivalice. If I see a movie first, I can’t read the book. The suspense is ruined and I get bored. My favorite Chick Lit book is Sophie Kinsella’s Remember Me? It was witty and the characters were amazing. I basically knew the ending, but it was done well. Super cute summer read! I prefer cardboard/thick paper bookmarks. Laminated! No, bells. No whistles. No dangly stuff. Just a simple, beautiful bookmark. I bought 2 bookmarks on my honeymoon. I got them laminated and lost one. I’m so upset about it! So, now I only have 1 bookmark to my name. The longest book I ever read was probably either a Harry Potter book or Outlander by Diana Galbadon. Somewhere around 700-800 pages, maybe more. My computer randomly decides I’m not connected to the internet and kicks me offline. I lose everything I’m doing. Not sure if that’s bookish, but it relates! I order my bookshelves by starting with favorite books first and working my way down. My favorite series of all time is the Karen Marie Moning Fever Series (or Harry Potter lol). The Fever series is the ONLY series I’ve ever read more than once to completion. When moving to my current house, I lost most of my Harry Potter books. They are gone. I’m seriously heartbroken. I am now seeking a pretty special collectors edition, so I can pass them down to Lil One. I took a Speed Reading class in High School so I could get outta gym and art. Both of which I’m horrible at. Funny enough, I don’t read quickly now. I’m capable, but I usually only get a few minutes here and there in a day. I will put down a good book for a great video game with my hubby. Fatal flaw! So, that’s all for now folks! Hope you enjoyed my 25 bookish facts and I didn’t bore you to tears! lol Come on back for more posts soon! I have always been an avid reader. I grew up loving How To Eat Fried Worms by Thomas Rockwell, Tales of a Fourth Grade Nothing by Judy Blume, Bunnicula by James Howe and Maniac Magee by Jerry Spinelli. Soon, I grew up a bit and was interested in other cultures and their struggles. Examples like Island of the Blue Dolphins by Scott O’Dell and Julie of the Wolves by Jean Craighead George. I did go through a Dean Koontz faze and devour everything he wrote. As time went on though, I started to be less and less interested. Now I enjoy thrillers, mysteries, and the occasional chick lit. My latest craze is the Fantasy genre. Anyone else love it as much as me? I blame my husband, who got me into video games! I am constantly seeking out a story to rival the Final Fantasy series. If you are a fan, please check out my Lets Talk Games section! This leads me to this blog and why you are hopefully here! 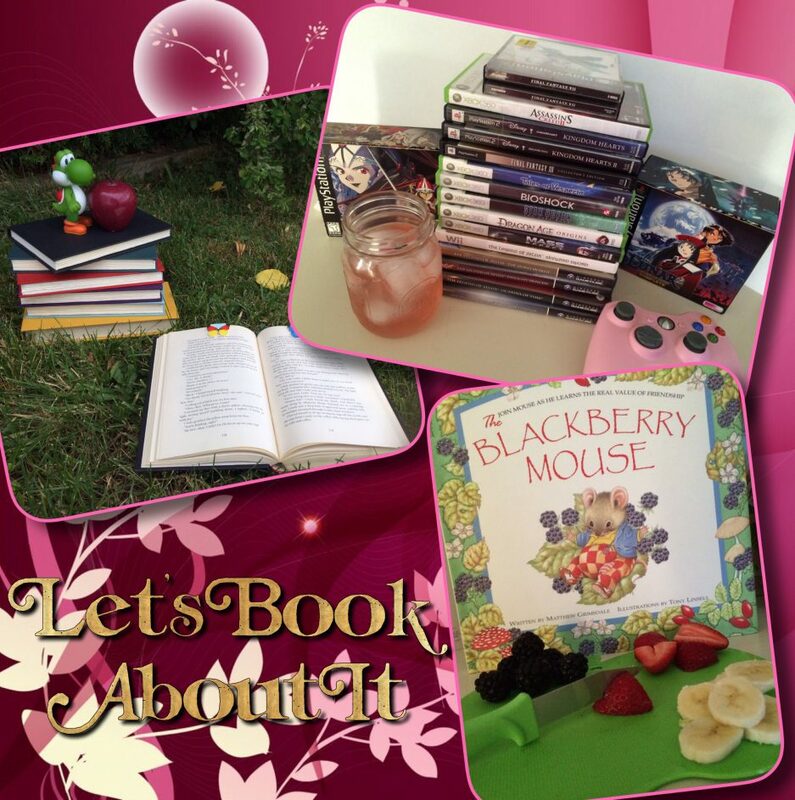 On this blog, I want to share Bookish Thoughts with Book Lovers and I will also do Book Reviews! It’s casual. It’s fun. I hope to make some friends! So, I would love to know what kinds of books you are interested in!! Please leave me comments! Let’s start off this review by mentioning a few key bits of information. I was told via BookTubers, that I did not need to read the trilogy. I may miss out on some key terms, but I would pick them up quickly. So, I got the book and settled down for Rainbowthon (please ask if seeking more info). I started off the first chapter and was a bit perplexed by the terms. I believe it was the authors reasonable assumption that you would read her trilogy first. I was able to make my way through and the plot was quite interesting. I kept going chapter by chapter and I definitely started to love the characters. Yet, each time I read a term or location, I second guessed whether I should have known this already. I have since learned, via a kind BookTuber who read the trilogy, that all this info WAS indeed NEW. Yet, I was dumb enough not to ask her until 1/2 way through the book. Nice one! This is why I point it out now for you! It took me forever to get through the first 160 pages, because of my need to reread/commit to memory. Overall, the characters were my favorite part of this book. They are a group of rag tag thieves and their goal is to pull off the ultimate heist. For me, it was a combo of video game RPG characters…meets Ocean’s Eleven. Their heist is full of twists and turns you never know what’s going to happen even when you think you do. Back to the characters! Kaz is the leader and I really couldn’t stand him at first, but it all changed for me when I learned his back story. You see, Leigh Bardugo slowly weaves back stories into the book. Down to the last 3/4 of the book I was still learning fun tidbits! It was fantastic! You never feel like you are lost in terms of character development, but you keep learning more as the tale goes on. I loved how she did it. I wish I could explain it better. So in the end, I gave Six of Crows a solid 4 out of 5 stars. I fell madly in love with the cast of characters and want to befriend them all. I enjoyed the overall twists and turns of the heist. The terms were tricky at first, but once I relaxed and understood where the story was taking me, I was in love. Please let me know how you enjoyed this book or if this review made you want to read it! So, I can remember going over to a neighbors house to play Mario Bros when I was a kid. Unfortunately, I only made it to the fish level or just past it and then it was time to go home. If you remember, the “fun” part about Mario Bros was that you COULDN’T SAVE! Ugh! So, each day I’d get past those fish and “Time to GO!” I never came close to beating that game. Years later, I’m dating my gamer bf (now husband). He teaches me about all kinds of games. I thought they were cute. Fun. Like Mario. He could have his fun. Little did I know, games like Final Fantasy 12 existed! My hubby puts FFXII in and my whole world changed! What a BEAUTIFUL game! The opening cinema alone was magical! It looked like a movie! I had no idea video games could look like movies! The story was so epic! Side Note: FFXII Story…The Princess marries the Prince. Beautiful Opening Cinema. They come to the castle and then all heck breaks loose. War is closing in on the Princess’ city. Her father and her new husband have to go sign a treaty to end the fighting. When there, they are ambushed. A man, believed to be the Kings Right-Hand-Man, kills the king and the young Prince. That’s just the very beginning! The betrayal, the surprises, it’s epic! I was in charge of the strategy guide. I gave the “commands” and my hubby did all the heavy lifting. We beat the game and we enjoyed every second of it. What a rush! Now, I’m still his “wing girl”. I jokingly say, “I’m the brains. He’s the brawn.” That’s how we navigate all RPGs! We play Metal Gears, Mass Effects, Dragon Ages, God of War, you name it. RPGs are always my favorite. Kingdom Hearts and Final Fantasy taking the lead. What kinds of games do you like? Please leave me kind comments below!